The Indus Ringette Association gave young athletes an opportunity to learn about the sport during the Come Try Ringette event on March 30 at the Chestermere Rec Centre. President of the Indus Ringette Association Lorna Engleson said she first became involved in ringette after her daughter went to a Come Try Ringette event five years ago. “I love the sport. I love watching it. I told my kids I didn’t care what they joined, but I will learn to like it, and I love ringette,” Engleson said. While the intent of Come Try Ringette is to teach young athletes about the sport and spark a new interest for ringette, it is also a great way to recruit new members for the upcoming season, Engleson said. 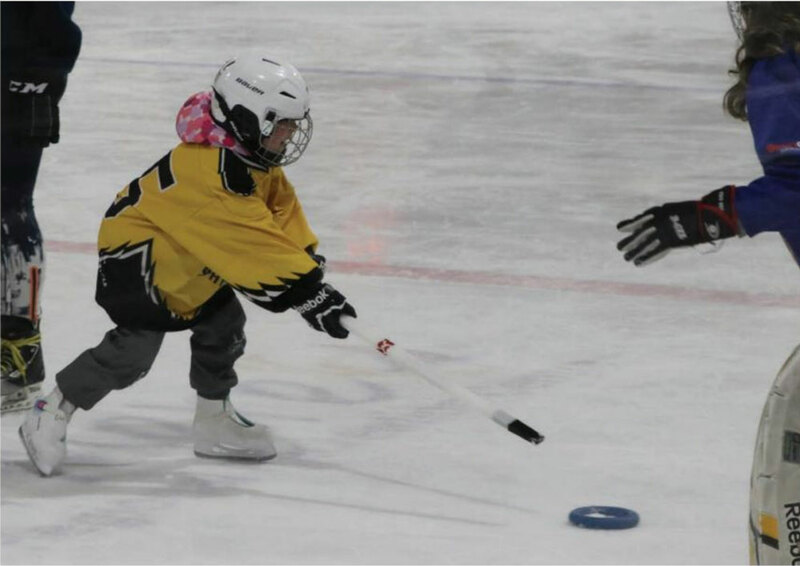 “Our goal is to give kids exposure to the sport, show them how much fun it is, how fast it is, and recruit new members that maybe didn’t think ringette was a sport they would like,” she added. After learning the fundamentals of ringette, athletes had an opportunity to register for the upcoming ringette season, Engleson said. Throughout the afternoon, a group of instructors were out on the ice teaching 26 athletes ranging from five-years-old to 12 years-old the basics to ringette. With having one of the highest turnouts for Come Try Ringette, Engleson feels as though the Indus Ringette Association had achieved their goal of exposing athletes to the sport and sparking a new passion for ringette in young athletes. For Engleson one of the best parts of organizing Come Try Ringette was seeing people who have tried the sport before coming back and trying it again, along with seeing all the new athletes learning a new sport. “For me, it’s so nice to see somebody who has just started ringette, they can barely even get on the ice, and now they’re skating, picking up the game, and developing as an athlete,” Engleson said. Ringette is an excellent sport that teaches athletes fundamentals such as teamwork, commitment, possibly coaching and mentorship, and relationship building, Engleson said. A significant benefit she has seen with ringette is athletes develop a different friend group apart from school. “When they come to play ringette it’s fun because they get to see friends that they haven’t seen all week,” Engleson said.